How could something so sweet be so bad? By Katherine Brown – Oakland Voices 2012. Even though growing up in the 1980s on 85th and Olive had its challenges and difficulties, there are still memories that I look back on with fondness. Especially in the summer time – this always seemed like the best time of year on my block. It only seems like yesterday that my friends and I lived without a care in the world, and laughed and played like there was no tomorrow. I can still hear the ‘whoosh!’ sound the tether ball would make as it swung around the make-shift pole – i.e., the stop sign. Or the snapping of that old telephone cord as we played double-dutch in front of my house. I can remember how my feet would sting from each pounce I would make on the pavement. It seemed that the only disagreement that we had to settle was who would jump first – which we usually solved with the flip of a penny. But no day would be complete unless we held one of the sweetest celebrations ever known to this Earth (well, in my opinion at least) – the coveted candy party. Each of us would ask our folks for a dollar. We would then have a brief strategy session to decide what sugary treats we would get. 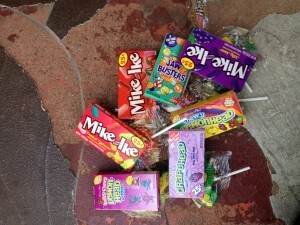 With about $5 between us, it was off to the two corner stores on 86th and Bancroft to claim our goods. We would leave with brown paper bags just about to overflow with Now-and-Laters, Blow Pops, Mambas, Corn Nuts, and occasionally, cotton candy. We would then head to the porch of one of our houses and divvy up our goods – equally of course – making sure that each and every one of us would get our fair share. And if it was a super hot day, we would make sure that we at least saved 25 cents to buy an Icy – which was Kool-Aid frozen in a red plastic cup. Mountain Berry was my favorite. Oh, sugar. It seems like, at that time, no one had much of a problem with you. As long as we kept you in moderation, and as long as we were active, we would be in good shape (no pun intended). Today, we have a national obesity epidemic. A new report says that in less than two decades, half the population in 39 states could be obese. California’s adult obesity rate, the study shows, could reach above 46%. Not overweight. Obese. And, sugar – it seems like nowadays you’re catching a lot of the blame for a massive problem that weighs heavily on cities such as Oakland. I am a program manager at a local health department where I manage a nutrition and physical activity program. With dedicated staff who are determined to putting an end to this obesity epidemic, we design and implement activities to promote healthy behaviors. We specifically target low-income communities – those very similar to the one I grew up in. Sometimes, I feel that my childhood has given me a little advantage in the work that I do – especially in understanding what other outside factors make it hard for people to be physically active or eat healthy. Violence and crime in streets are huge obstacles to health. Who wants to take their family for a walk if they don’t feel safe? 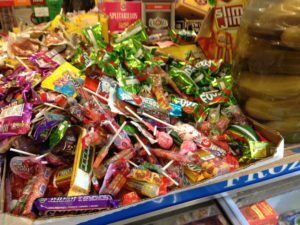 Mountains of candy are not the only cause of the obesity epidemic. By Katherine Brown, Oakland Voices 2012. And then there’s the question of food. Liquor stores are everywhere, overflowing with sodium-filled and sugary foods, and in some instances, stocked with food that has been on the shelf way past their expiration dates. Not to mention the fast-food restaurants with $1 menus that are seen as undeniable deals for families that are on extremely tight budgets. I know that there are on-going efforts to bring better food to everyone. I salute them. In the meantime, though, sugar is the low-hanging fruit. It’s there. It’s easy. Every corner store is filled with candy, cakes, sodas, syrupy drinks. Cheap, quick fixes that we’ll be paying for for decades to come. Add to all of this an economy that has been rough for many people long before the large-scale meltdowns of the last half decade. The economic perils of the recent years have had a huge impact on people’s abilities to access, adopt, and maintain healthier lifestyles. Dollars for health, education, and social service resources and programs are dwindling. It appears that we have become unable to afford to be healthy. Everyone needs a place to buy quality, affordable food. Kids and grown-ups need safe places to walk, run and play. Zoning, budget cuts, and mixed-up priorities keep these from becoming more of a reality for many East Oakland neighborhoods. If good food, exercise, and low stress are keys to fitness and beating back obesity, then I know lots of communities that are in big trouble. In order for us to even move the needle on this obesity issue, we have to consider so much more than what people or eating and how physically active they are. Bear in mind why people are eating what they eat, and why they aren’t being as physically active as they would like to be. Which brings me back to the good old days. As a kid, sugar was a big part of my life and diet – but my mother and grandmother did a great job of making sure that my siblings and I only had candy and desserts in moderation. They always stressed the importance of meals filled with fruits and vegetables that we were fortunate to have grown ourselves, right here in East Oakland. Plus, we had tons of opportunities to be physically active – at home, and definitely in school. I miss those huge kickball tournaments, and my after-school karate classes I took at the youth center on the corner of 82nd and East 14th.I wasn’t alone, either. My whole family was about being active. I cherish the memories of me and my grandmother skipping to my dance classes from 85th and Olive to 85th and East 14th, and all the way back. Even though these blocks were hit hard by drugs and violence, I still felt safe. I was fortunate for the abundance of resources and practices that kept me from being overweight – regardless of the amount of sugar I consumed. But today, I realize that not many kids are as fortunate. My colleagues and I, as health professionals, face a hard fight in making the kinds of opportunities I had as a kid realities for people today. I think it’s a blessing that I am a health educator who works to encourage healthy behaviors and lifestyles. One of the reasons I chose to go down this path is because I saw the effects chronic illnesses such as cancer and heart disease were having on my family and community, and I wanted to make a difference. But I do struggle with understanding how to provide sound education and resources without judging or victim-blaming the communities I serve. My dear, sweet, sweet sugar. My heart aches for you, as I know that your intent is not to do harm. In my childhood, you meant such happiness. But in my adulthood, I see how you can cause such sadness and pain. If only finding solutions to epidemics like this were as easy as flipping that penny to chose who would jump first.